I just returned from America’s Largest Antiques and Collectible show in Portland at the Expo Center. There were over 1,000 booths and this year they debuted the custom knife show as part of it. Still, there were mostly booths of antiques and collectibles and lots of vintage Christmas. Ok, so, first I want to start by telling you about Monticello Antique Marketplace and Stars Antique Mall as that is where we went on Friday. 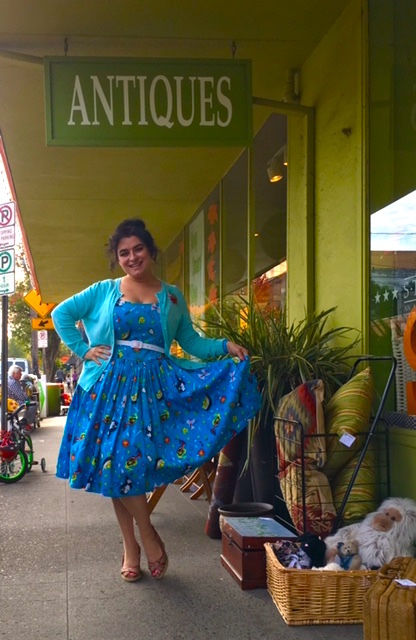 Ok, so my twin sister and I and my niece woke up early to kickoff our antiquing weekend in Portland. Monticello opened at 10am so that is where we headed first. There is always so much to see at this mall and they have a nice mix of antiques, collectibles, salvage, and yard décor, shabby and painted items too. It’s a multi-dealer large mall with a nice coffee shop too. Monticello was all decked out for Halloween and in mid November they have their spectacular Christmas extravaganza…. You HAVE to see it!! After Monticello we headed to Stars Antique Mall. I love Stars, it is always so much fun at this mall. Stars is a multi-dealer large mall with a location across the street as well called Stars Too. This trip I was in search of vintage Pendleton wool plaid tartan blankets for an upcoming photoshoot…. It is going to be an out-of-this world photoshoot so you’ll want to check back. We ended up meeting the adorably sweet mother of the two owners of Stars. She and I had a great conversation about Northern California Wine Country, she was so sweet!! Found the vintage Pendleton blankets and some other fun goodies too! The show started bright and early at 9am on Saturday and my twin sister and my niece were in line with tickets in-hand by 8:45am. Doors opened promptly at 9am and in rushed the crowds!! The first booth I walked into I found some amazing vintage Norcrest bluebirds and vintage mermaids and fish – Yippee!! The dealer was super nice too. Score! The dealer with his amazing vintage Disney and Disneyana collection was there (I love walking by each year and drooling over the collection). 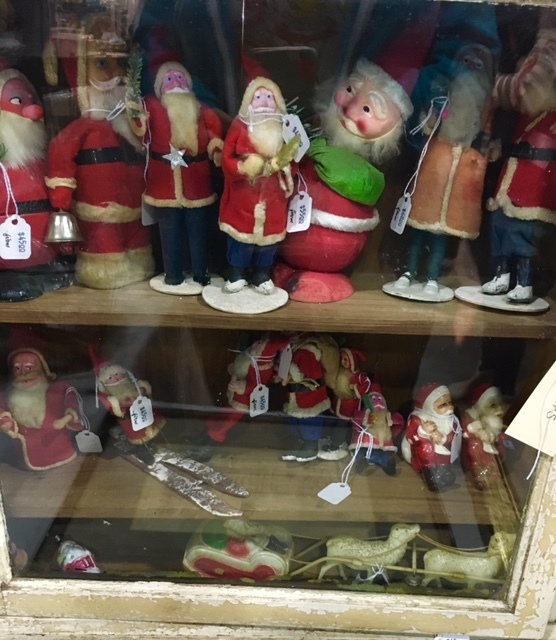 The dealers with the rare vintage tin toys were there as well as lots of vintage sterling silver, vintage clothes, and kitchenware and more mantiques than I recall seeing at previous shows. There was even a huge area setup of Legos as the show had a vintage Lego collector there with all his amazing Legos. He was sill setting up or I’d have some pics for you all. I also ran into Magpie Ethel crafter extraordinaire. She was so sweet and all smiles, we even posed together for a picture. 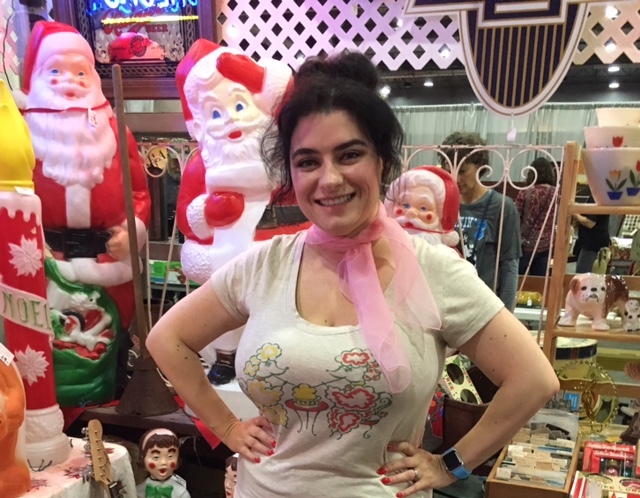 I love her vintage Christmas crafts and have been following her blog and Instagram feed for sometime so getting to meet her in-person was so much fun. 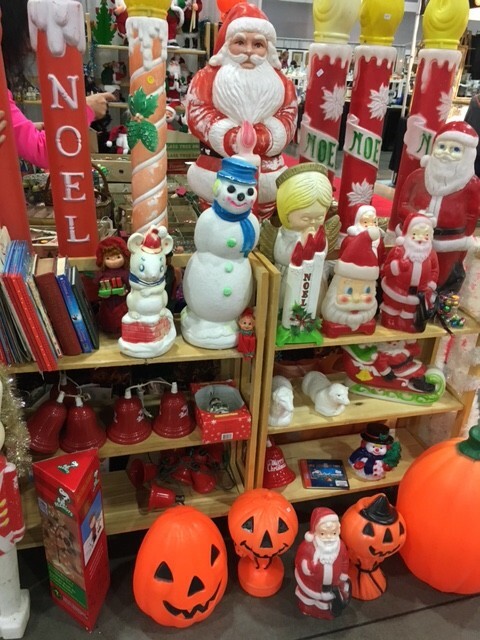 My sister and I did end up with some amazing vintage Christmas collectibles as that is our main reason for attending this Fall show and we were not disappointed. Overall, dealers were sort of quiet…. You’d walk into their booths and many didn’t look up or say hi. I don’t know, maybe they were tired or not yet awake or who knows. But, we had a blast and I have to say the food court was great, especially the vendor with hiss kielbasa dogs from his homemade recipe; so yummy!! Such a great time was had this weekend. I met so many amazing people and saw so many incredible antiques and collectibles. Spending time with my twin and family was magical and now I am over-the-moon to be home with my hubby… I missed him terribly.